THIS IS A TRUE SPORTS ROADSTER, 1 OF 1452 MANUFACTURED IN 1962. IT HAS THE FIBERGLASS TONNEAU COVER WITH BUILT IN HEADRESTS, KELSEY HAYS ORIGINAL WIRE BASKET WHEELS, AND THE 390 ENGINE WITH CHROME ACCENTS. IT HAS BEEN TOTALLY RESTORED, LOCALLY, AND THE MILEAGE IS BELIEVED TO BE TRUE. A REALLY NICE SPECIMAN OF A RARE CAR WITH FLAWLESS PAINT AND IMMACULATE RED INTERIOR. AND THE 390 ENGINE. IT HAS BEEN TOTALLY RESTORED AND THE MILEAGE IS BELIEVED TO BE TRUE. A REALLY GOOD SPRCIMAN OF A RARE CAR. 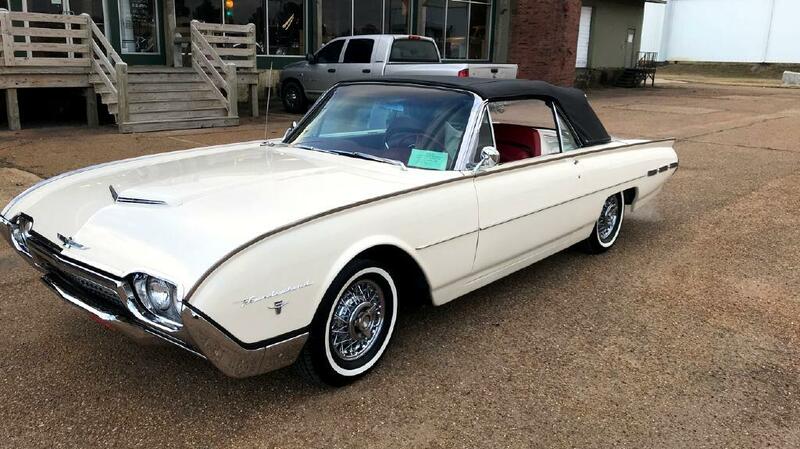 Message: Thought you might be interested in this 1962 Ford Thunderbird.